Our CEO, Susan Rann, is celebrating after winning the Innovator of the Year – Non Credit category at this year’s Women in Credit Awards. She was recognised for demonstrating achievements that have brought something new for the financial services sector and beyond. Since becoming CEO of Paylink Solutions in 2018, Susan has focused on developing market-leading software solutions for the financial services sector. With a thirst for innovation and new technology, Paylink Solutions is leading the innovation of new affordability tools for the sector. 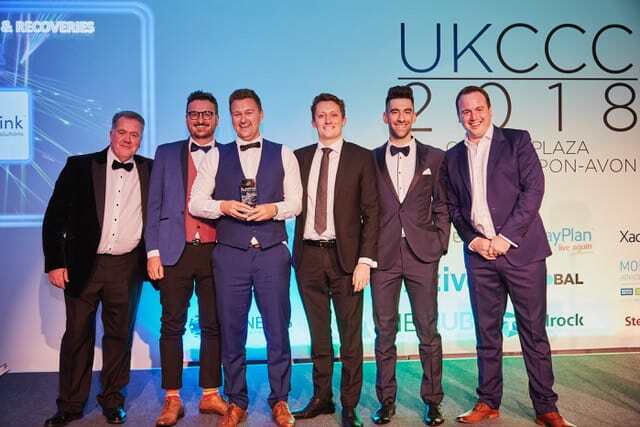 Our sister company PayPlan, one of the UK’s largest free debt help provider was also successful at the prestigious ceremony. CEO Rachel Duffey took home the Transformation of the Year and Business Leader of the year awards. Credit Strategy launched the Women in Credit Awards in 2018 to empower, connect, support and uncover achievements among women in the profession. The ceremony was held in London on Thursday, 21 March. Find out more about how Paylink Solutions can benefit your business here. Chief Executive of Paylink Solutions, Susan Rann, has been shortlisted for Innovator of the Year at the Women in Credit Awards. Credit Strategy launched the Women in Credit Awards in 2018 to empower, connect, support and uncover achievements among women in the profession. The Innovator of the Year award will go to a woman who has demonstrated achievements that have brought something new – such as change in process, strategy or technology – to the organisation she works for. Since becoming CEO of Paylink in 2018, Susan has focused on optimising customer experience within the financial services sector by developing market leading software solutions. With a thirst for innovation and new technology, Paylink is leading the development of new affordability tools for the sector as a whole. Paylink announced an ‘Open Banking’ partnership in October 2018. The technology provides a solution to engage customers and allow them to quickly and securely provide accurate financial information. The partnership allows Paylink clients to collect the right information from their customers and third-party organisations, whilst providing transparency and accountability throughout their whole journey. Our team is celebrating after being victorious in the Innovations in Collections and Recoveries category at this year’s Credit & Collections Technology Awards. We’ve been recognised for the custom-built one-touch referral system we delivered for customers of a banking client who are in financial difficulty, at the prestigious ceremony in Stratford-Upon-Avon this month. Our new system has drastically reduced the amount of time it takes for customers to receive debt support and empowers them to take control of their financial situation. This accolade is our second recent success after also receiving ISO accreditation for our data security policies and how we continuously monitor and improve our products and information systems. Susan continued: “Although accreditation isn’t mandatory, we thought it was an ideal way to prove our acumen when we showcase our services across the sectors we currently operate in, including lending, mortgages and insurance. Contact us now to find out how our award-winning expertise can benefit your business. We’re delighted to announce we’ve been shortlisted for two categories at this year’s Credit and Collections Technology awards: the Innovations in Collections and Recoveries and Affordability Assessment Solutions categories. Our entry in the Innovations in Collections and Recoveries category is for the custom-built, one-touch referral system we designed for one of our banking clients. This new software allows our client to contact and assist customers who have fallen behind with monthly payments, by providing them with an online tool to take control of their financial situation. Within the Affordability Assessment Solutions category, we’ve been shortlisted for the digital debt solution tool we created PayPlan, our sister organisation which offers free debt management plans and a range of other solutions for people struggling to repay their debts. Thanks to our expertise, their clients can now complete details of their income and expenditure online allowing an expert adviser to quickly and easily recommend the most suitable debt solution for their circumstances. The annual Credit and Collections Technology Awards brings together the industry’s leading players to champion innovation and best customer outcome solutions, recognising technological achievements from specialist providers within the credit and collections industry. Winners are being announced during the prestigious ceremony at the Crowne Plaza in Stratford-upon-Avon on 13 September, and we can’t wait for the night to find out if we take the top spots! We’re delighted to launch our brand new identity and website, which the whole team has been working really hard on to deliver. From now on, Embark and Paylink are the two main products, with Paylink Solutions being the umbrella company. Embark provides client on-boarding software, digital data capture and detailed customer analysis. PayPlan’s financial affordability tool PlanFinder, which allows clients to seek debt advice as part of an online journey, is a great example of how Embark works. PayPlan is one of our sister companies within the Totemic group, which provides free debt management plans and other solutions for people facing financial difficulties. Paylink specialises in collections and distributions software, which allow clients to carry out multiple payments at once, distribute money and generally manage their finances. Susan Rann, Paylink Solutions’ CEO, said: “We decided to launch our new brand and proposition to promote the full capabilities of our software, so clients are more aware of what we can deliver, and how it can be adapted to businesses across a range of sectors. “We’ve also identified opportunities within the lending, lending, buy-to-let and insurance markets, and are going to use our industry and development knowledge to demonstrate how Paylink Solutions can make a real difference to customer satisfaction and service delivery within these areas. Paylink Solutions is celebrating after being officially recognised for its outstanding efforts in keeping clients’ data safe and policies on monitoring and improving its information security systems. The team was awarded with ISO accreditation for its compliance within all aspects of IT governance, information handling, data protection and privacy. ISO 27001 is a standard, which demonstrates an organisations’ ability to develop and deliver outstanding information security management. Assessors from the British Assessment Bureau carried out a rigorous four-day audit, which consisted of interviews with employees and thorough reviews of all Paylink Solutions’ policies and procedures. Expertise within the team was highlighted too, including the way all procedures are continually monitored, measured and analysed to make sure software systems are delivering the best possible service, and updated to coincide with new regulations, for example the recent introduction of GDPR. Susan continued: “This accreditation follows months of hard work by all members of the team, and I would like to thank those involved for their outstanding efforts to make the audit a success, in particular, Roxy, Matt, Carl, Rich and Usha.